by Kelly Daniel, Nacogdoches County Chamber of Commerce Nacogdoches County Chamber of Commerce board of directors have named Nacogdoches County Peace Officers as the Large Business of the Year, a Gary Justice Business Excellence Award sponsored by R & K Distributors, Inc. Recipients include the City Police Dept., the County Sheriff's office, SFA Department of Public Safety, the Nacogdoches Highway Patrol, the Texas Rangers and Texas Game Wardens. R & K Distributors Branch Manager Scott Goodrich nominated the group with the notation that "all law enforcement positions are high stress and the level of danger is increasing daily. Nacogdoches is lucky to have the 'best of the best' serving in these capacities." As the City celebrates its Tricentennial anniversary, it is fitting to note that organized law enforcement in Nacogdoches "can trace its beginnings to June 5, 1837 when Republic President Sam Houston signed a bill into law creating the Corporation of Nacogdoches," said Sgt. Greg Sowell. "The law provided for the election of a corporation constable, the first Nacogdoches police officer." The department developed over time and improved with technological advances. A marshal was appointed in the late 1800's. In 1929, the city reorganized and the marshal was officially named chief of police. At that time, the NPD had one police car, and citizens would go through the phone operator to contact officers. A polygraph machine was added in the 1960's. During that decade and into the '70's, a high band, two way radio system improved communications, and a Criminal Investigations Division was created. "Today, the NPD is a modern law enforcement agency and is prepared to meet the challenges of the future," Sowell said. The beginnings of the Texas Rangers are also linked to a well-known historical figure. "The Texas Rangers were created by Stephen F. Austin in 1823 when he established an organization of colonists to 'range' the colony and protect colonists from external threats. The organized protectors were referred to as Rangers," said James D. Hicks, Texas Ranger, Company A, Nacogdoches. "From 1823 through about 1920 the Texas Rangers evolved from a primarily para-military organization into primarily a law enforcement/criminal investigative organization. In 1935 the Texas Rangers merged with the Texas Highway Patrol into the newly created Texas Department of Public Safety. Since 1935 the Texas Ranger Division has been tasked primarily, but not exclusively, with major crimes investigations." Texas Rangers provide criminal investigative assistance to local, state and federal agencies when requested or assigned. They are tasked with conducting public integrity/corruption investigations and often requested to conduct law enforcement officer involved shooting and use of force investigations. Texas Rangers provide security to visiting dignitaries and are responsible for many border security operations. "There have been many changes in policing over the past hundred years due to advanced technology, increased population, and the creation of new laws," Ranger Hicks said. "One thing remains constant, a law enforcement agency's success hinges upon support by the citizenry." Most people would be surprised to know that the office of sheriff has a proud history that spans well over a thousand years. The size of Texas Sheriff's offices are as diverse as the population of their counties, and the Sheriff must work with all segments of government and other law enforcement agencies to serve and protect the citizens of their counties. The Office of Sheriff in Texas was created by the Texas Constitution. There are 254 Counties in Texas and each county has a Sheriff. By statutes, the Sheriff is a Texas peace officer, a conservator of the peace who enforces the criminal laws of the State, and is responsible for the county jail, bail bonds, civil process and security of the courts. "The Sheriff’s Office is different than other law enforcement agencies," Sheriff Jason Bridges said. "it is directly accountable to the citizens through the election of the Sheriff." Sheriffs are directly accountable to their constituents, their state laws, their state’s constitution, and the United States Constitution. Nacogdoches County has a rich tradition of County Sheriff’s. One of our most recognized and respected Sheriff’s that served Nacogdoches County is the former Sheriff John R. Lightfoot who served for 24 years from 1960 to 1984. "We have seen many changes in law enforcement since Sheriff Lightfoot was in office, but one thing will always remain the same, to serve our citizens to the best of our ability and to maintain peace and order in our great county," Sheriff Bridges said. Marc Cossich, executive director of the SFASU Department of Public Safety, said, "providing a safe environment for SFA students is the department's mission. It is achieved by protecting people and property on the SFA campus, detecting and preventing crime, apprehending offenders, enforcing the laws of the state and safeguarding the individual and collective rights of the citizenry." The department began as campus security and has evolved into a full service public safety department. It provides police, parking, safety technology and emergency management services to a campus community of more than 14,000 students, faculty, staff and visitors. The SFA DPS developed a safety product known as Jack Alert for emergency notifications. Jack Alert communicates through text message, voice call, email, social media. television and an outdoor siren system. Additionally, a mobile devise application named Lumberjack Guardian is used on-campus and gives real-time interactive features such as a panic button and tip texting. 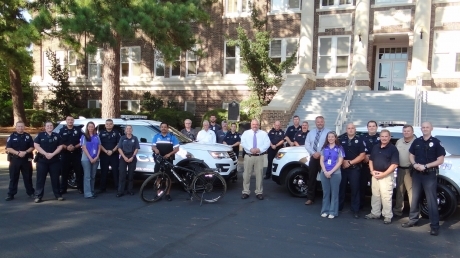 "The goal for providing a safe campus so that all can achieve their educational goals is attained by not just the dedication of the SFA DPS personnel, but the community as well," Cossich said. "We are fortunate that community involvement with SFA is high." The motto of the Texas Highway Patrol is "Courtesy, Service, Protection," and Sgt. James Brazil stated the mission is to "protect and serve Texas." The Texas Highway Patrol works to combat crime and terrorism and enhance highway and public safety, statewide emergency management, public safety licensing and regulatory services. "The first Texas State traffic laws were enacted in 1907," Sgt. Brazil said. "During the early 1920’s civic minded officials and citizens began advocating the State Legislature the need for statewide enforcement of traffic laws. In 1935 the State Legislature created the Texas Department of Public Safety giving the Texas Highway Patrol full enforcement powers." Since 1895, the Texas Game Warden mission is to serve the citizens of Texas by providing professional law enforcement, water safety and search and rescue, while working to conserve and protect the natural resources of Texas. "All of our officers are encouraged to become active in the communities where they live," said Capt. Shawn Phillips. "It is great that the Nacogdoches County Chamber has recognized the services provided by all these officers." "R&K Distributors, in particular the late Gary Justice who the annual business awards are named after, have always been avid supporters of Nacogdoches law enforcement organizations. We are proud to be a part of this well-deserved recognition," Goodrich said. The Nacogdoches County Peace Officers will be honored as Large Business of the Year at the Nacogdoches County Chamber of Commerce 95th Annual Meeting & Membership Banquet along with The Hospice of East Texas Shop, Small Business of the Year; Banita Creek Hall, Medium Business of the Year; and Citizens of the Year Charlotte and Gary Lee Ashcraft. The event is Sept. 27 and will be held in the SFA Baker Pattillo Student Center Grand Ballroom.